The NEA EXIM Banks Association is a flexible finance platform, created by the member countries of the Greater Tumen Initiative, to back up implementation of the large infrastructure development projects needed and approved by the countries, to improve facilities in transport, energy, tourism, etc. in the Greater Tumen Region and thus promote economic prosperity and good neighbourhood in the region. 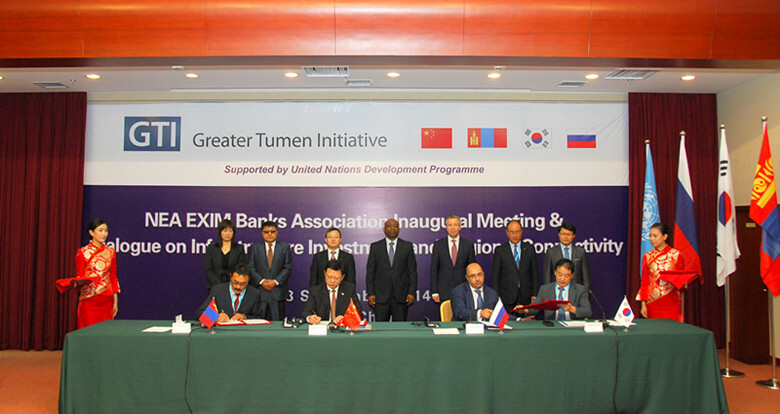 The Association consists of the EXIM Bank of China (China Eximbank), the Development Bank of Mongolia (DBM), the EXIM Bank of Korea (KEXIM), and the Bank of Development and Foreign Economic Affairs of Russia (VEB). The MoU on the Establishment of the NEA EXIM Banks Association was signed on 10th October, 2012, during the 13th GTI Consultative Commission (CC) Meeting by the three initial member banks: China Eximbank, DBM and KEXIM. The VEB joined the Association on 8 August 2013. The association was officially established with the signing of the Framework Agreement at the 15th Consultative Commission Meeting of GTI and its Inaugural Meeting and Dialogue on Infrastructure Investment and Regional Connectivity on 17-18 September 2014 in Yanji, China. The Vision and Mission of the Association is to address the bottleneck of lacking financial resources, impeding the development of NEA region. The NEA EXIM Banks Association is designed as as an effective resource mobilization mechanism to expedite and co-finance hard projects in the Greater Tumen Region, including but limited to the ones listed under GTI Regional Transport Strategy and other sectoral strategic documents.